Protest: Stop the NT Intervention – Jobs with Justice now! 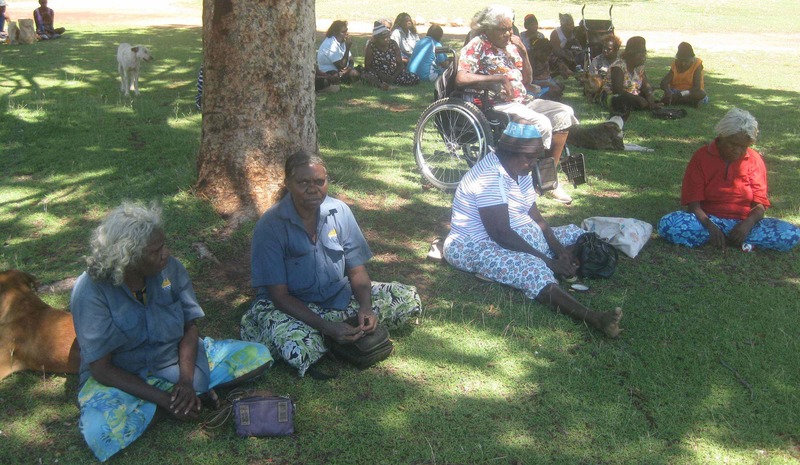 Recent weeks have seen a renewed offensive against Aboriginal communities in the NT. Opposition leader Tony Abbott visited Alice Springs to call for a ‘second Intervention’. Minister Jenny Macklin has indicated that draconian Intervention powers could be extended well beyond their ‘sunset clause’ in 2012. On Thursday, town camp leader Barbara Shaw will join a protest in Sydney to tell the real story of the Intervention – racism, mass job losses and the break up of communities. 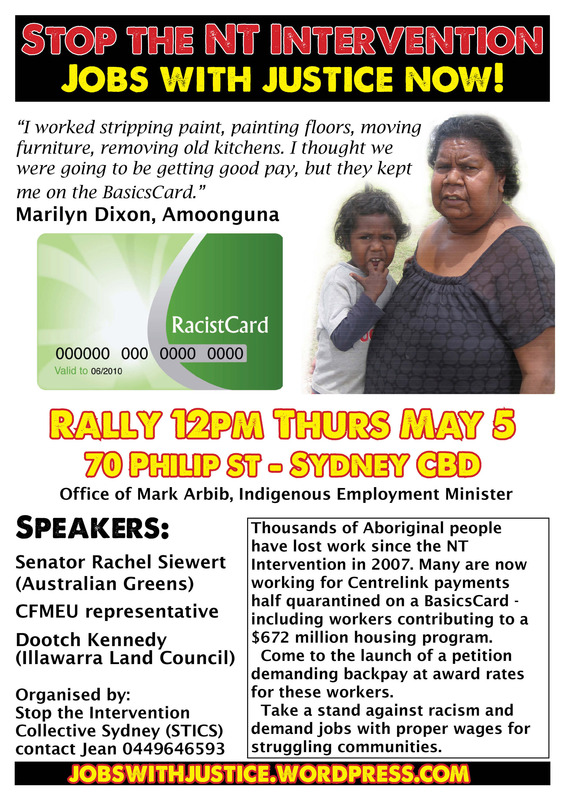 The rally will launch a petition sponsored Unions NT and the CFMEU demanding backpay at award rates for Aboriginal people working for Centrelink payments, half quarantined on a ‘BasicsCard’, as part of the reformed Community Development Employment Program (CDEP) introduced alongside the NT Intervention. 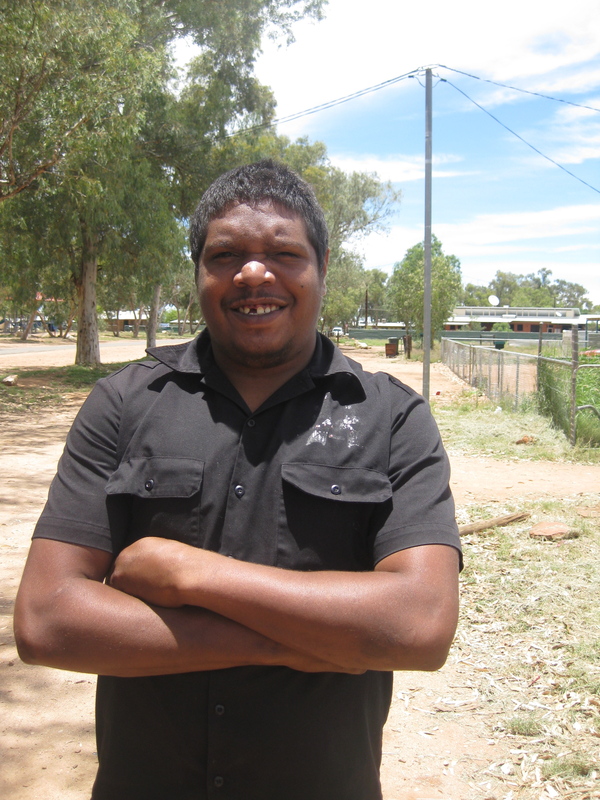 Thousands of NT Aboriginal workers have been made unemployed by reforms to CDEP and many others are suffering under the exploitative conditions of the new program. The petition has a particular focus on the use of ‘BasicsCard’ workers by the $672 million Intervention housing program (SIHIP). While contractors like Leighton’s Holdings have made millions from SIHIP, Aboriginal people working on housing renovations have been paid as little as $6 per hour. Most remote communities have been deemed “economically unviable” by the NT Intervention and stripped of resources and employment in an attempt to force Aboriginal people into the “mainstream”. Living conditions are deteriorating in the these communities and enormous pressure is being put on urban centres like Alice Springs as people migrate to town. But the government is refusing to change course. In response to the mounting social crisis in Alice Springs, an extra 100 CDEP positions have been created to complete jobs such as installing post boxes, cleaning graffiti and landscaping. This is continuing the gross discrimination against Aboriginal workers – people will only by paid Centrelink and the BasicsCard for what should be proper municipal work! Say no to a “second Intervention”. Join the fight for an end to arrangements forcing people to work for the BasicsCard. Demand investment in community based employment programs across all Aboriginal communities that pay proper wages and include the right to join unions. This petition is being sponsored Unions NT and the CFMEU. It demands justice for Aboriginal people working for Centrelink payments, half quarantined on a ‘BasicsCard’, as part of the reformed Community Development Employment Program (CDEP) introduced alongside the NT Intervention. The petition has a particular focus on the use of CDEP workers by the $672 million Strategic Indigenous Housing and Infrastructure Program (SIHIP). We are demanding backpay at appropriate award rates for all of these workers, along with an end to arrangements forcing people to work for the BasicsCard and investment in community based employment programs across all Aboriginal communities. Since then, the CFMEU has taken up the case of the SIHIP workers. Senator Mark Arbib claimed again in February that every hour worked on SIHIP has been paid at award rates. But time-sheets and pay-slips obtained by workers at Amoonguna prove that despite records of working up to 50 hours a fortnight, workers were only ever paid for 15 hours. Others only received Centrelink and the ‘BasicsCard’. More than 2000 people have so far signed hard copies of this petition – thanks for all the support! The return date set for the petition was originally March 15. However, due to irregular sittings of parliament, the petition will not be presented to the Senate until May 12, giving us more time to build support. We are deeply saddened learn of the passing of Mark Fordham, who has been so central to the Jobs with Justice campaign. Mark died suddenly in Darwin in February 2011 at the age of 37. Mark toured Sydney and Brisbane in October 2010, speaking to hundreds of workers on construction sites and wharfs, as well as addressing uni students and Aboriginal organisations. Mark was so passionate about winning decent wages and conditions for Aboriginal people. Mark’s passing is a tragic and shocking loss to the Aboriginal rights movement. We dedicate this page to him and to continuing his struggle. WARNING: This site contains videos and pictures that feature people who have passed away. Please support the petition running from December 2010 to March 2011. The petition is being sponsored by the CFMEU (Construction Forestry and Energy Union) and Unions NT. It has a particular focus on the use of CDEP workers by the $672 million Strategic Indigenous Housing and Infrastructure Program (SIHIP). We are demanding backpay at appropriate award rates for all of these workers, along with an end to arrangements forcing people to work for the BasicsCard and investment in community based employment programs across all Aboriginal communities. SIHIP has been plagued by controversy due to bureaucratic waste and disempowerment of communities. Close to $200 million was spent before a single house was built. Only 16 communities will receive new housing under SIHIP despite desperate need across all Aboriginal communities. New housing is contingent on the signing of 40-year leases with the government. All communities are now being charged ‘market rent’. To offset this controversy, the federal Labor government has trumpeted a 30% Indigenous employment participation rate in SIHIP. But under questioning by Greens Senator Rachel Siewert, Indigenous Employment Minister Mark Arbib conceded that CDEP workers have been included in this 30%. He falsely claimed that all work done as part of SIHIP has been paid at or above award rates. The testimony below of Aboriginal workers from Santa Teresa and Amoonguna tells a different story. Please print off the petition and circulate amongst friends and workmates. The petition will be presented to the Senate in March 2011, so please return all copies to the CFMEU Darwin, PO Box 3046, Darwin NT 0801 by March 10 2011. Remember Wave Hill? Gurindji strike again! More than 200 Gurindji people joined an 11am stop work meeting today in Kalkaringi, 470kms South-West of Katherine, NT. The rally was attended by workers from across the community including from the Victoria Daly Shire, Kalkaringi service station, the mechanics, the clinic and the school. 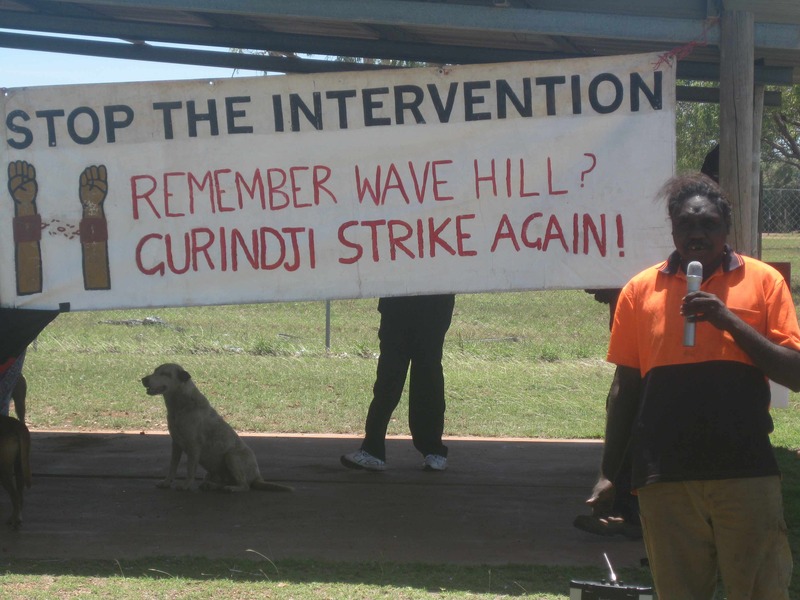 The Gurindji are demanding an end to the NT Intervention, investment in proper jobs and return of control over land, employment and services to Aboriginal people. The protest was also joined by many non-Aboriginal support staff living in Kalkaringi, representatives from the LHMU and delegations of Aboriginal people from Alice Springs and nearby communities. Support messages were read out from a diverse range of organisations including the National Aboriginal and Torres Straight Islander Ecumenical Commission, local pastoralists, the Greens, St Vincent De Paul Australia CEO John Falzon and World Council of Churches representatives from Native American tribes and the Philipenes, as well as members of the Arts including writer Rosie Scott. The crowd was addressed by veterans of the 1966 Gurindji walk-off from Wave Hill station such as Bernard Jalyirri, who called on the youth of the community to show similar determination in the fight against the NT Intervention. Of major concern is the loss of jobs and exploitative employment conditions created by attacks on the Community Development Employment Projects (CDEP). Protest organiser John Leemans said that more than 250 people had been employed in Kalkaringi and Daguragu on the CDEP program. There are now less than 40 participants. 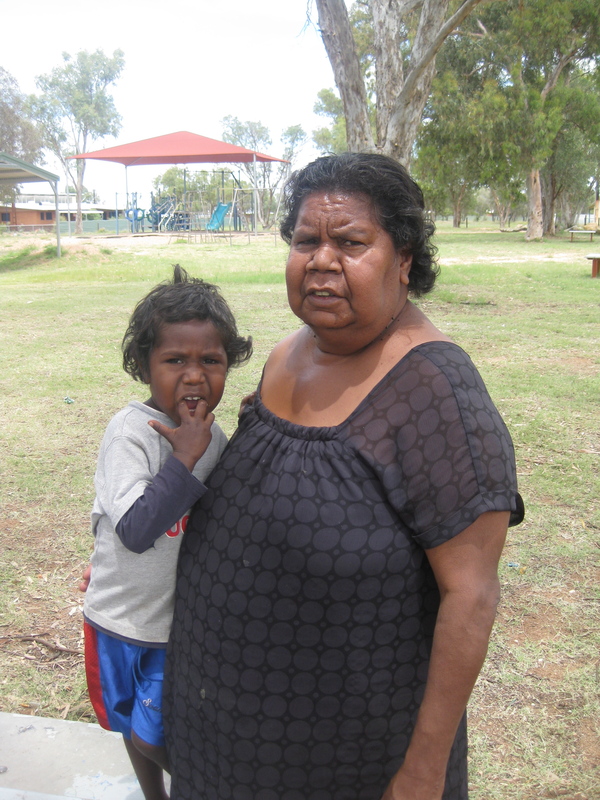 The smaller Gurindji community of Daguragu has been particularly hard hit, with the closure of many programs included the CDEP office, a brickworks, a retirement home and the family centre. John Leemans said, “at Daguragu, people are still taking their rubbish out from the community in their own cars, because of the pile up since the Intervention cut our services”. Payment for the ‘reformed’ CDEP is now administered through Centrelink’s Income Management system. “They took our land at Daguragu with a 5-year lease without asking. That is very wrong. Gough Whitlam gave us that land back. They don’t need a permit now. Everything is very hard since they stopped the CDEP, there’s no workers there now. I think they want people to move away from that place. But Gurindji will never leave. We will fight until we get our land back”. The rally voted to endorse a statement demanding an end to the Intervention and ‘Jobs with Justice’ for Aboriginal workers, which will be published in the Australian newspaper and launched with national protest rallies on October 29. A Gurindji delegation will travel to Alice Springs to join the protest. WARNING: this video contains images of people who have passed away.